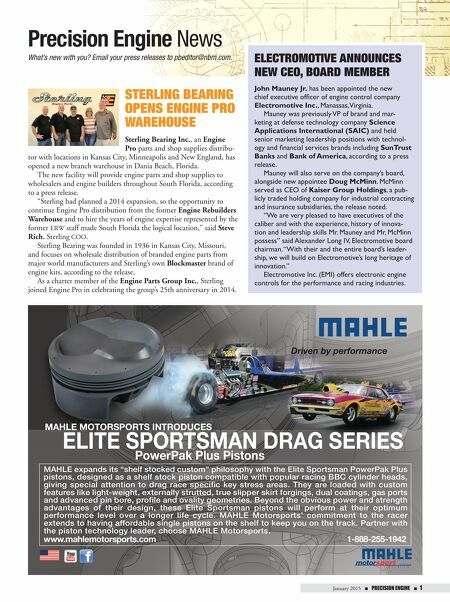 January 2015 n PRECISION ENGINE n 1 Sterling Bearing OpenS engine prO WarehOuSe Sterling Bearing Inc., an Engine Pro parts and shop supplies distribu- tor with locations in Kansas City, Minneapolis and New England, has opened a new branch warehouse in Dania Beach, Florida. The new facility will provide engine parts and shop supplies to wholesalers and engine builders throughout South Florida, according to a press release. 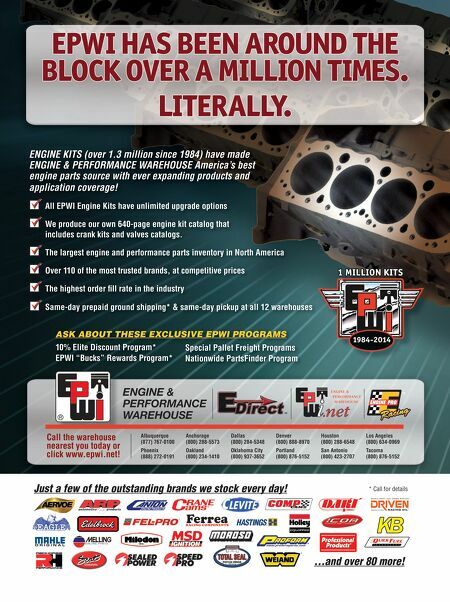 "Sterling had planned a 2014 expansion, so the opportunity to continue Engine Pro distribution from the former Engine Rebuilders Warehouse and to hire the years of engine expertise represented by the former ERW staff made South Florida the logical location," said Steve Rich, Sterling COO. Sterling Bearing was founded in 1936 in Kansas City, Missouri, and focuses on wholesale distribution of branded engine parts from major world manufacturers and Sterling's own Blockmaster brand of engine kits, according to the release. As a charter member of the Engine Parts Group Inc., Sterling joined Engine Pro in celebrating the group's 25th anniversary in 2014. What's new with you? Email your press releases to pbeditor@nbm.com. Precision Engine News electrOmOtive annOunceS neW ceO, BOard memBer John Mauney Jr. has been appointed the new chief executive officer of engine control company Electromotive Inc., Manassas, Virginia. Mauney was previously VP of brand and mar- keting at defense technology company Science Applications International (SAIC) and held senior marketing leadership positions with technol- ogy and financial services brands including SunTrust Banks and Bank of America, according to a press release. Mauney will also serve on the company's board, alongside new appointee Doug McMinn. McMinn served as CEO of Kaiser Group Holdings, a pub- licly traded holding company for industrial contracting and insurance subsidiaries, the release noted. "We are very pleased to have executives of the caliber and with the experience, history of innova- tion and leadership skills Mr. Mauney and Mr. McMinn possess" said Alexander Long IV, Electromotive board chairman. "With their and the entire board's leader- ship, we will build on Electromotive's long heritage of innovation." Electromotive Inc. (EMI) offers electronic engine controls for the performance and racing industries.